Living in a society which encourages spending, it can be difficult to remember the power of having savings. Cash, however, creates opportunities that spending never can. 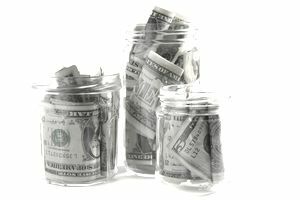 An emergency cash fund is simply a savings account, and having one in the appropriate amount will change your life for the better. Why? When something unexpected comes up, your emergency fund protects your other long-term investments. You use your emergency funds so you don't have to withdraw from a retirement account (like a 401(k) or IRA) and pay early withdrawal penalty taxes, or so you don't have to sell long-term investments (like stock index funds or bond mutual funds) at a bad time. Also, cash puts you in a position to buy when everyone else wants to sell, allowing you to make money in good and bad times. For this very reason, we encourage people to have an "opportunity fund" as well as an emergency fund. The opportunity fund is cash set aside that you can use to invest during bad times in the real estate or stock markets. First, you have to build up your emergency fund. Good: At a minimum, you should have three months of living expenses in your emergency fund. This means if you need $3,000 a month to cover your basic needs like your mortgage or rent, utilities, gas, and food, then you need $9,000 in your emergency fund. Better: If you have people who depend on you financially, like children or a spouse, your emergency fund should be six months' worth of living expenses, at a minimum. In addition, if you work in a career that has high turnover or a high injury rate, you'll want to have double the amount of emergency fund as someone who works in a tenured career where layoffs rarely occur. Best: As you get better at saving, work toward accumulating 12 months of living expenses in a savings account. If you're a high wage earner go for the $100,000 challenge: Get $100,000 of savings parked in a safe investment. Too many high wage earners feel the need to invest everything—which leaves them no liquid assets left over for emergencies or opportunities. Where should you invest your cash reserves? In a safe, easily accessible account. Not in stocks. Not in something that has withdrawal penalties or big tax consequences for cashing it in. In Making Safe Investments, we cover six rules to use on investing safely. The key is your emergency fund should be in something low-risk. If you need some motivation to save a bit more, print the top 10 reasons list below and tape it to your refrigerator door, put a copy on your desk at work, or keep it in your car. Read it frequently, until you can feel the power of cash—until saving feels better and more powerful than spending. Once retired, if you are over age 59 1/2 you can withdraw from IRAs, 401(k)s, 403(b)s and other types of retirement accounts; any withdrawal is subject to income taxes, but not penalty taxes. Many people think that since they can withdraw at will, they no longer need an emergency fund. This is not true. Hopefully, you've drafted a thorough retirement budget, but invariably you will be missing some expense items—and emergencies will still happen. The most common unforeseen expense we see occur in retirement is when someone's adult child has an emergency. Even in retirement, you'll want funds that you didn't include as part of your official retirement plan, and you'll want them set aside in cash, just in case. Building up this type of cash reserve account is one of the five steps you'll want to take within five years of retirement.